The Patrick Taleb team came together for a day of inspiration and fashion to raise funds for underprivileged children in Haiti and in Miami. Catwalk for Charity featured runway shows from Nicole Miller & Gustavo Cadile – hair and makeup for models & celebrities by Patrick Taleb Salon. More than 400 of South Florida’s most fashionable men and women came out on June 16th to celebrate the VIP Grand Opening of our new location. Couture-inspired hair and makeup models mixed and mingled with the crowd, as guests enjoyed an evening of signature cocktails, salon swag bags filled with Kérastase and Oribe luxury hair care products, and $2,000 worth of salon giveaways. It was the place to be and be seen, and Eye on South Florida TV was there to capture the highlights of the evening. Soraya Taleb from Patrick Taleb Salon was interviewed on SFLTV’s Inside South Florida Morning Show. The feature included a first look at the new salon, introduced Patrick Taleb’s Ponytail, Braid & Bun Bar, and discussed trending summer hairstyles for men and women in South Florida. 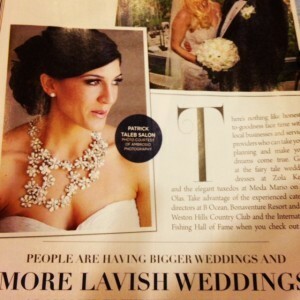 THINK Magazine included a guide to over the top weddings – including the best of the best in attire, venues and hair. Patrick Taleb Salon was recommended as the premier salon for bridal hair and makeup, both in-salon or at the destination of choice. The salon was also described as “different from the rest” in that our stylists offer their services throughout the wedding party, where brides can change their hairstyle and makeup for different events throughout the night, from the ceremony to the reception.